IT'S BIKE CRAFT! 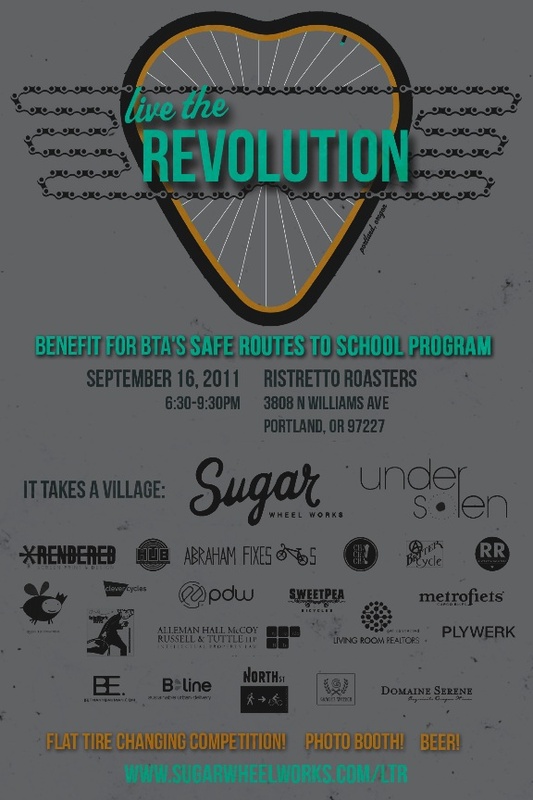 We will be there with a some very special bicycles showing off the custom build-ups and overhauls we specialize in. 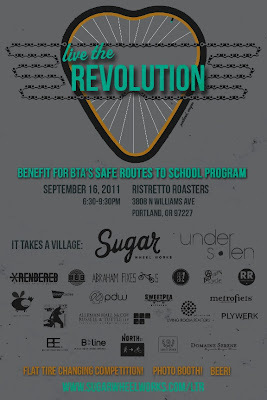 Also, there are three certificates in the Bike Craft raffle good for redemption at A Better Cycle. check it. We will be closed Nov 24th and 25th for Eat Day and Buy Nothing Day. Everybody get stuffed and save your cash for Buy Local Day November 26th. SUPER SURPRISE SALE! Support Buy Local Day! Nearly everything in the store will be on sale. 10% to 50% Off! We have entirely to much inventory going into winter and we need to get rid of stuff. Sale Saturday November 26th and Sunday November 27th only. The best place to get holiday presents for your bike riding loved ones (including yourself) is the annual Bike Craft Fair. This year it's at Sandbox Studio and is 2 full days of crafty-goodness. More details, check out the new Bike Craft website. Closed on Monday July 4th! Heya! We'll be closed to the public for the day of Monday July 4th. Normal hours will resume Tuesday bright eyed and bushy tailed at 10 am. Amidst the various Knog lights (we have the new Boomer USB rechargeables) and under the Planet Bike Superflash lights, we now have BAR END LIGHTS by SunLite. They look pretty unassuming in their little package, yet once installed are a rockin' option for your required rear red reflector. Watch the videos below to see the lights in action. Sitting Pretty, Brooks are back. Sometimes you get lucky and whatever saddle came on your bike is adequate. Other times you may want an upgrade. Brooks saddles are the leather saddle to buy. We had some VO brooks-like saddles, but they just aren't nearly as wonderful, so we're bringing the real Brooks back. In stock are four of the most commonly purchased Brooks saddles. Are you attending the Alice Awards? I've been keeping an eye on the growing list of donors and awesome live auction items coming up at the BTA's Alice Awards. A Better Cycle donated three packages for the silent auction. Two items I made exclusively for the event: a one-of-a-kind medium tool roll, and a one-of-a-kind mini quilt shown below. Hip pouches, and a chicken! I love getting new Bike Craft wares in stock! After having an appliqued Black Star hip pouch with Oregon on it hanging out for a while, Dave kindly traded us for this green hip pouch with a chicken on it! He's also coming by later this week to drop off stock from their current run of hip pouches. I'm hoping we'll get to have one or two of his backpacks on consignment once they are done too. Also new are the Mini-You Pouch by new-to-Portland bag makers BLAQ Design. It's such a cute little size with a nice pocket and sturdy velcro. It'll be perfect for carrying your utmost essentials. The BLAQ pouches have a built in u-lock holster and they fit the mini-bulldog u-locks we carry. 87 local punch cards in one! 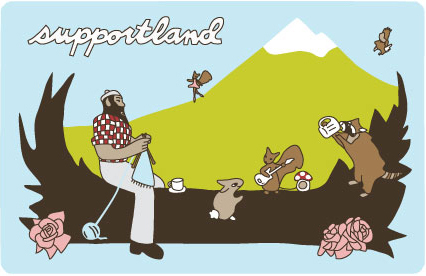 We are now part of the lovely Supportland network! Basically, you get a free Supportland card at our shop (or one of the other 86 local businesses who are also on the network) and you earn points and rewards by shopping locally. For instance, when you get 10 punches at our shop, you earn a Bike Cozy tool roll! And once you've earned 250 points you could redeem them at our shop for $25 off your next tune-up! Or if that flat tire is keeping you from enjoying our intermittent sunny days, you can redeem 75 of your Supportland points for a tube change (including a new tube). Check out what Supportland businesses are in your 'hood. From coffee shops to yarn stores and creative coaching, there's a big range of local awesome going on that you ought to get in on. Brand New Mixte Bikes for Sale! With more and more people in Portland riding bikes, and more and more people moving to Portland because they can ride bikes here, the local stash of used bikes and frames is depleting quick. Craigslist bike prices are rising exorbitantly as people hark back on their economics 101, supply vs. demand. So while we would love to have more used bikes to offer, it is getting harder and harder to find them, buy them, do all of our work and stay within a reasonable budget for you, our customer. As you'll hear if you're shopping for a used bike at our shop... every used frame / bicycle that you see on our sales floor has been thoroughly checked over and rebuilt. As a matter of fact they have all been stripped down to a bare frame and fork, all wear-out parts are replaced, and anything that doesn't quite work right is replaced with wonderfully working bits. This level of scrutiny takes time, yet it is the only way we can guarantee that the used bikes on our floor will work as new (better than new in some cases!) We guarantee every bike on our floor. So as the used bikes in town are harder to get a hold of, we have realized we need a replenishable source of frames and bicycles to build. Enter our brand new Origin8 "Mixer" frames and builds. I just rode this beaut around and it makes a wonderful city rider! And as with any complete bicycle you buy at A Better Cycle, you get complimentary cable adjustments (within the first 100 miles, so we can adjust the stretch) and a complimentary tune-up within the first year! The model we have built up, on hand, is a 54cm. We have 4 sizes of this bike to build up, so if you're looking for a bike and think a step-through might be the one, we've got your size. And we're just getting started! You'll be seeing more new builds as we assemble the bits and spec out additional frame styles. We got an email in our inbox about a week ago from one of our customers, on behalf of the Environmental Law Caucus, a forum for environmental stewardship and appreciation at Lewis & Clark Law School. 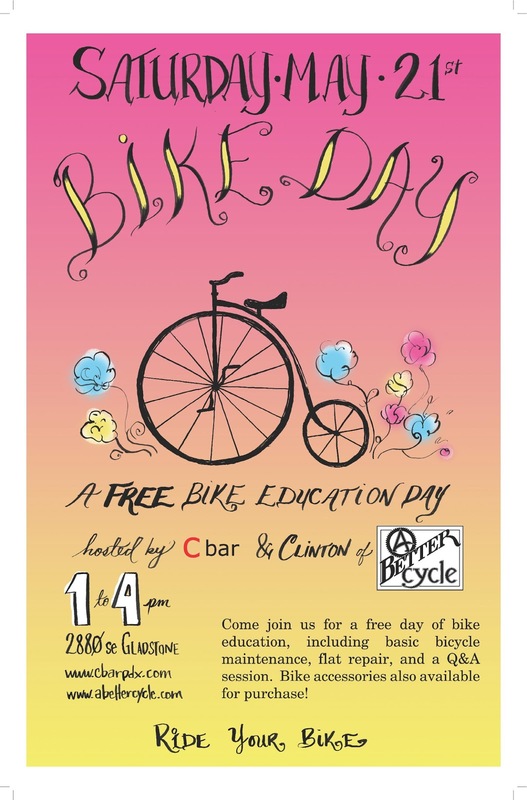 Liv was asking for donations for their upcoming (Mar 3) Bike to Eugene Challenge, when a gaggle of riders will pedal 140 miles from Portland to the Public Interest Environmental Law Conference at the University of Oregon. Being her neighborhood shop we're so pleased to put together a little care package for the group of bicyclists on their long ride. We're hoping to do more for next year's ride, with a little more notice. Until then I hope the conference is awesome and we're looking for a full recap of the ride when they get back! As promised, Truce is ready. Two backpacks ready for you to come and check out. Like I mentioned last week, the detailing is really impressive. Reflective bits abound to add little pecks of visibility at night. The lines of the backpacks are smooth. The size of these "medium" backpacks leaves me feeling it would hold just everything I need on a day to day basis without letting me overpack. Not pictured are special cords (stowed in the top compartment) which attach easily to side buckles and can turn into compression straps if you find yourself out and about needing just a little more space. Truce prides itself on re-purposing high-performance fabrics that may have been otherwise discarded. Sails, waterproof drysuit cloth, and ballistic weaves are reclaimed and assembled with high-performance hardware at our shop in Portland, Oregon. At Truce, everything we make is a limited edition. I'm really excited to be carrying Truce Designs. It just warms my little Bike Craft loving heart. Oh so soon, you'll be able to shop and compare not 1, not 2 yet 3 local bag makers at our shop. Soon, and very soon we'll have two backpacks by Truce Designs up on our Bike Craft Wall. These bags are seriously detailed and well thought out. I spoke with Luke when he dropped the bags off earlier this morning and every detail on the bag has a reason behind it. One of the things I was ultimately impressed with is Luke's commitment to sourcing as many of his materials from US manufacturers as possible. From USA made buckles (all except the whistle buckle) to USA made zippers and reclaimed marine materials for the bodies, these backpacks are tight. My snapshot does no justice to the superb craftsmanship. For beautiful photos and explanation of features visit Truce's website and blog respectively. We'll have, to start, the medium backpack retailing for $230. Save up your nickels and dimes boys and girls, until then we're drooling right next to you. A little compendium of the current selection of Black Star goods and North St Bags we have at the shop..
Oregon pri-zide showing up with a brown applique on pine green cordura. Hip pouch with ready-made awesomeness, belt included. A Tan (with yellow?) insides convertible pannier to backpack. This is the Woodward style from North St Bags. The other North St convertible pannier in stock, wine with blue accents. Black Star messenger bag, understated brown with the Black Star. A leftie messenger bag, the bag goes on opposite most messenger bags. The advantage? When you're checking over your left shoulder in traffic, you can actually see what's behind you because the high bulk of the bag is over your other shoulder. Same leftie bag with showing the green innards. Aaron with the empty bag on. Black Star Bags wallets! One of the ways Black Star reduces waste is by converting smaller scraps into useful objects like wallets. heart. While it still just looks like the mechanic area of a bike repair shop, we're real proud of our mini-winter-remodel a couple of weeks ago. Stuff that was piled on Ian's floor, piled on Ian's bench. Aaron and Clinton moved most/all of the other stuff that was taking up floor space. Where'd all the stuff go? Down on the sales floor, one of the many reasons we had to close for the process. We all met Monday morning, caffeine in hand, to tackle the carpet removal. With everything moved, it became so much easier to see just how disgusting the carpet had become over 3 years of mechanickery. It's so satisfying to see a transformation like this, tearing up the carpet and padding and tack bars and staples and all, ah. . . accomplishment! And suddenly a ninja appeared. Pry bars and hammers were necessary to get all the tack bars detached. After dozens of rounds of sweeping, Ian and Clinton decided the floor was sufficiently prepped for the floor sealer, which meant it was time to don shoe booties to avoid tracking any dust/dirt upstairs. Everything's back in place and we added some shelving units. And hopefully the new shelves will aide in better organization versus just more stuff. Shelves! Oh, btw those stacked rims are all tubular rims that we would l-o-v-e to sell. Get in touch if you're interested ABetterCycle [at] gmail [dot] com.